Bringing home a new puppy is exciting and fun! But there is more to it than just taking a new puppy home and playing with her. If you want to avoid chaos and confusion, you’ll need to do some upfront preparation. You need to have your puppy’s space ready for her, and you need to have some puppy supplies on hand. 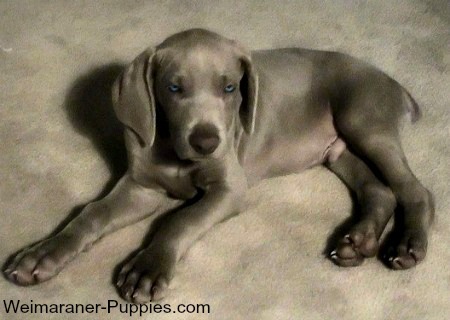 You’ll want your new Weimaraner puppy to be comfortable and secure, from the moment that she arrives. Coming to live with you is a big deal for your puppy. She will probably be a bit scared and disoriented for a little while. After all, she will have to get used to being in a new place, with new faces, and she will need to learn who is now part of her “new pack”. when he first comes to your house! It may be tempting to have a big celebration party when your puppy arrives. 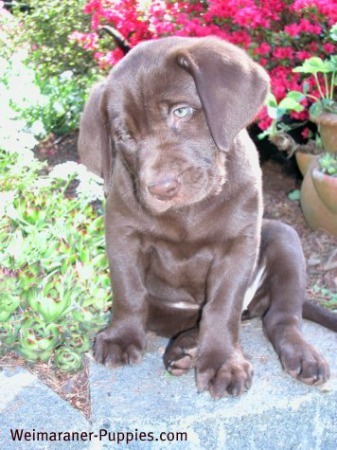 But your puppy will be much more comfortable if he has time to become acquainted with JUST your immediate family. This is a time for bonding with the Pack and getting to know each other. And for your new puppy to get to know her new home and surroundings. 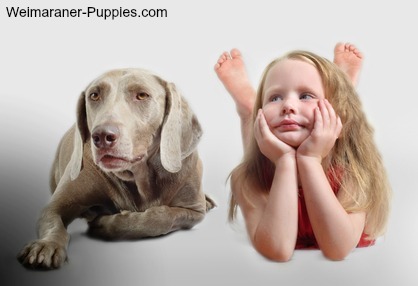 It is important to help your Weimaraner puppy feel accepted and loved. You need to talk to her, hold her and pet her for short periods of time. After all, she is feeling a bit homesick for her mother, brothers and sisters. And she misses her old surroundings. While everything will be new and frightening at first, your new puppy should adjust quickly, and soon she will be an important part of your family. There will be lots of excitement at your house, when your new puppy arrives. And the last thing that you need to do, is run to the store several times to get puppy supplies that you need. It is best to have everything ready before bringing home a new puppy. • Familiar smells – Bring a towel, toy or just a piece of fabric that has spent some time at the puppy’s former home. You can ask the breeder to purchase a toy (Offer to pay for it.) or give you an old towel that has spent time with your puppy’s mother and siblings. Familiar smells will help him to feel comfortable in your home. 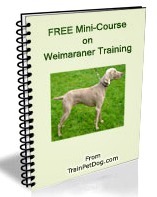 •Large breed puppy food – Use the same puppy food that the Weimaraner breeder has been giving the puppies. Before bringing home a new puppy, ask what puppy food she has been eating. Purchase some of the same puppy food so that your new puppy will be eating food that she is used to eating. Changing her diet when she has a nervous stomach can lead to digestive problems like diarrhea. • Daytime puppy crate – Using a crate for housebreaking a puppy, makes the job a lot easier. However, even if you plan to use another method for housebreaking, a crate is still a good idea. A crate that is open lets your puppy see the family, but also helps her feel safe in her own space. If you place the crate in the same room as family members, your puppy will start to feel part of your family. • Crate pad or bed – Purchase a nice soft puppy bed so that your puppy will have a comfortable place to curl up and sleep. Her bed will define this area as a sleeping spot—off-limits for peeing and pooping. • Puppy collar and dog leash – While it may seem to be early for this, you are not really leash training at this point. You are keeping your puppy safe. If he needs to go outside (including when you are bringing home a new puppy from the breeder’s), you’ll want to make sure that he doesn’t run away from you—into the path of a car. • Pick up your puppy as early as possible. That way you will have a whole day to get used to each other, and for your new puppy to become accustomed to you and her new home. • Have someone go with you. If your puppy is not used to being in a crate, putting him in a crate for the ride home could be very frightening. Being held by someone is more comforting. However, NEVER try to drive while holding your new puppy! • Take towels or paper towels in case your pup urinates on the way home. It’s best to avoid giving her water during the trip (if it’s a short trip). This will help to avoid carsickness and will minimize her having to pee. • First thing when you get home, let your puppy explore his new yard for a few minutes. Place her in the location that you want her to use as her bathroom. If she goes, give her praise. • Show your pup her new water and food bowls. • Get down to his level. Sit or lie on the floor to socialize and get to know your new puppy. When you are smaller (not standing), you are less intimidating to a little one. 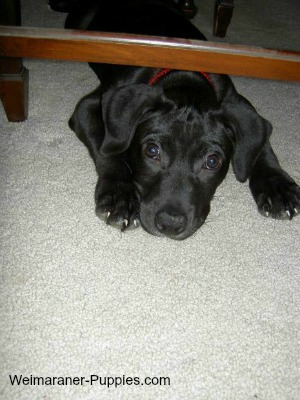 • Play together for a few minutes, and then let your puppy settle into his crate for a nap. Puppies need lots of little naps. Bringing home a new puppy is not difficult, and, if you follow these simple hints, the transition for both of you will be easier.